This water based formula will help shine and protect your interior and exterior with ease. This product was formerly known as the Chemical Guys Extreme V.R.P. because it can protect so many different surfaces like your interior trim, dashboard, moldings, exterior trim, tires, engine bay, etc. or any surface that is vinyl, rubber and plastic. It leaves a bold finish on any surface you apply it to, so it looks like new again. When you are done it is dry to the touch so you do not have a slick or oily feeling. The water based formula actually absorbs in to the surface conditioning and nourishing the surface. Most importantly it protects those surfaces from harmful UV rays that fade the surface over time. Just spray or wipe it on the desired surfaces and you'll have strong protection. 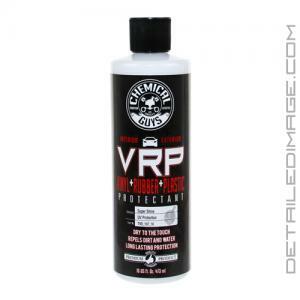 Chemical Guys VRP will help repel dust so the surface stays cleaner for longer. It also smells very pleasant so you'll enjoy applying it and having it in your vehicle. This multi-surface dressing is the perfect addition to any detailers collection who enjoys perfection from their products. This product does not come with a trigger, but the DI Accessories Adjustable Trigger works great if desired! EXTREME V.R.P. SHINE & SEALANT DRESSING Vinyl, Rubber and Tire Protectant restores, conditions and protects dull surfaces, bringing them to life, and enhancing them. A multi-surface shield for your vehicle's interior. Dual action premium dressing leaves surfaces 100% dry to the touch and shining better then new, while protecting the surface against dirt and dust. Formulated using industry leading sealants aids in protecting seats, steering wheels, door panels, and dashboard against these elements. Always apply to clean surface. Can be sponged on. When applied with a clean towel VRP will break down surface dust and dirt making them easier to wipe off. To achieve new surface shine simply wipe surface with product then lightly remove and excess with clean terry towel. For maximum shine apply a secondary layer and after a few minutes buff of excess to a perfect shine with microfiber towel. I'm actually a big fan of this. It works a million times better than armor all and better than any interior dressing I've used and product has lasted for me upwards to 2 weeks. Does a nice job on tires which is my prime purpose for this product. This will be purchased in a larger size next time I purchase. This is my new favorite tire shine, leaves a great finish that isn't too glossy, but still, makes the tires pop.